The longer that I teach music technology to my middle school students, the more amazed I am at what they are able to create when I am able to get out of their way. The difficulty in creating an environment that encourages and cultivates creating is breaking down the barriers to creation. In my experience, most of those barriers are created by the teacher. In order to overcome these challenges, I believe that those of us who are teaching music technology have to allow a radical shift in the paradigm of how we have traditionally approached teaching. Let me explain. Most of us who earn music education degrees come from a performance model of music education. We take courses in music theory, history, pedagogy, education philosophy and psychology, but essentially we are being prepared to teach students how to perform on their instruments or with their voices. Most of the theory and ear training courses that we take are for the purpose of analyzing more so than composing music. Sure we produce and complete part writing assignments, but again the primary purpose of those exercises is to assess our understanding of the theory. A composition class does not have the same purpose as a music theory class or even an arranging class. I acknowledge that we teach some aspects of music theory, history, etc. in our band, chorus and orchestra classes but for the most part, that content is only a part of the means we use to get us to the end of producing performers. Music technology curricula are relatively new (where they exist) in our secondary schools across the nation. 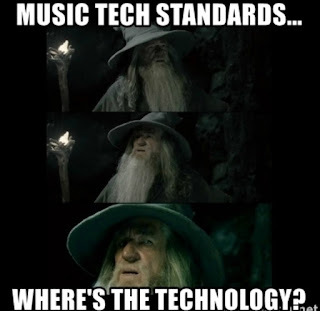 Those of us who are teaching these music technology courses with traditional music ed degrees have not been trained in the pedagogy of teaching music technology. What we know about music technology we have likely learned on our own, not from a professor of education. The consequence is that when we get a chance to teach a music technology class we take what we have learned on our own about technology and approach instruction from the perspective of our educational training and experience: performance. We are comfortable teaching technique and expression, but not creation. Some may argue that we teach creativity in our performance classes, but I don't know that I agree. We teach students how to interpret a composer's intent and how to perform expressively, but that is not necessarily creative especially when they are following dynamics written on their parts. Even when they do shape a phrase or perform some change in dynamics or articulation that is not indicated in the score, it is because the conductor told them to. Directing them to play expressively is not asking them to be independently creative. Another issue with music performance teachers transitioning to the music technology classroom is in our own comfort levels with the environment of the two different classrooms. A primary goal of any ensemble performance class is to get everyone in the ensemble to do the same thing at the same time. While I realize that this is a gross generalization and simplification of the process, it is more or less accurate. While we may teach expression, its generally not individual expression, but group expression. We want everyone expressing the same way and the same time. There is nothing wrong with this. This is an essential part of creating a musically cohesive ensemble performance. When you walk into a band, chorus or orchestra rehearsal area it will ideally be a scene where every performer is focused, attentive and waiting to follow the leadership of the conductor. We music educators love order and control. A music technology class is pretty much exactly the opposite. As a colleague once told me when I was seeking some advice about starting my music technology class, "Get ready to embrace the chaos!" Now, back to my original point. What usually happens when a music educator takes over a music technology class is we start teaching the way we were taught to teach or how we were taught ourselves. A performance based music educator tends to start with and focus on technique and theory (analyze/perform) while a composer or creator would typically start with a musical idea and then expand and develop that idea into a larger work (create). Yes you have to teach some the technique of how to use the technology tool and some basics of music theory, but my process is to show them enough to know how the tool works and then get out of the way and let them explore. Student: "What happens if I click this button or turn this knob?" Me: "I'm not sure, why don't you click it or turn it and let's hear what happens?" Could you image teaching a beginning band class where you show them how to put the instrument together, how to hold it correctly, a basic embouchure and then saying. "Ok everyone, start experimenting and see what kinds of sounds you can create! Use your imagination!"? Chaos, but that is exactly what you want to do in a music technology class. Teach them how the tool works then let them experiment, explore and create sounds. I focus on listening with my students. Do you hear a sound in your head? Can you recreate that sound using the technology? Experiment making sounds with the tool. If you hear something that you like, do it again. I use the 5 elements of music (rhythm, melody, harmony, form and expression) as the scaffolding to build my lessons around. The process is one where I show them how to use a tool to create one of those elements then get out of their way and let them experiment, explore and create. Then I will pull them back together and show them another technique or tool and then send them out to create on their own again. I basically repeat this process over and over again. Each time I pull them back in I put another tool in their tool box or show them another pathway to explore, but the goal is always to create. Adam Patrick Bell explains this clearly in his book "Dawn of the DAW" when he writes, "The overarching aim of DIY recording (music technology) is to make music with a DAW as opposed to learn how to operate one." "Music education needs to espouse the processes of recording as opposed to the products of recording." (italics added for emphasis). I couldn't have said it better myself. Now go embrace the chaos and be amazed! Spot on! Thanks for the post. I think your assessment is spot on... it definitely hits home with me. I majored in instrumental music education, graduated in 2001 and thought I'd be a band teacher for the next 30 years. However, since moving to Pittsburgh in 2008, the majority of my teaching has been in music tech lab settings. It is hard to overcome the training as a performer and belief that students for some reason need to learn theory and notation, as well as to be able to create music virtually exclusively using a MIDI keyboard. I still struggle to overcome a bias that loop-based music creation isn't very original and doesn't prove that a student is very talented or skilled. I like the comment "embrace the chaos" and welcome the belief that students can tap into their own creativity if we teachers get out of the way. This is a tricky one, though, when students then struggle to know how to begin, sustain themselves through the process, and end with something that they're proud of. Not to mention what this looks like to an administrator who walked into the classroom with their clipboard doing an unannounced formal observation. I think that speaks to a paranoia and skepticism that admin won't actually understand and appreciate project-based learning and the necessary in-class time to create something of which every student can be proud. Some may take a couple days whereas others may take a week or two.